NEW POOR'S HOUSE.—This house is rapidly drawing towards completion, and in the course of the ensuing week is expected to be ready for the completion of the poor. 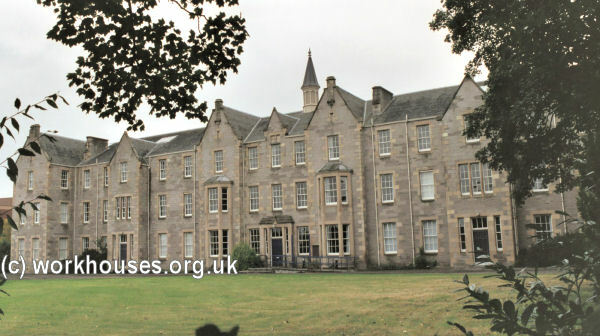 It is a fine building, and is peculiarly attractive and striking to strangers approaching the city, especially from the south, from the rise at Scooniburn, a point where her Majesty ordered a momentary halt of her carriage on her first visit to Scotland, to contemplate the magnificent panorama that then burst upon her view. The interior of the house is ample and capacious; the rooms are of large size, lofty, and ventilated upon the most approved modern principles. Baths, water-closets, and every aid that can be brought to bear upon the health, comfort, and cleanliness of the occupants, are in every department; while a fine prospects is to be had from the windows of the upper flats, east, north, and south. We believe the painters (Messrs. Maxtone and Porter) have to complete their work by Wednesday, and thereafter little will remain to be done. The painting work, as well as the joiner work, is highly creditable to the contractors, the principle rooms—those of the Governor and Governess—being strikingly elegant. A entrance block (now demolished) stood at the roadside at the north of the site. This probably contained a porter's room, and the relieving officer's office. The wings may have contained male and female probationary wards. 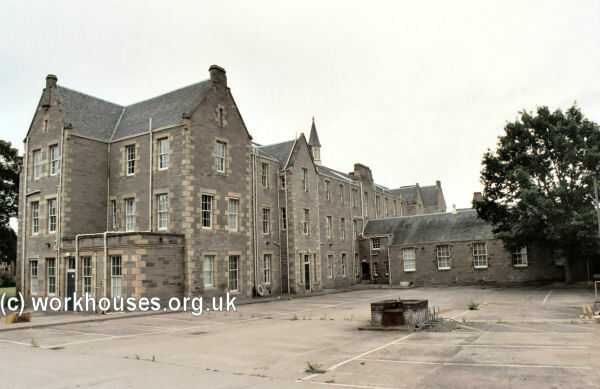 The main building had the H-shaped layout typical of many Scottish poorhouses. The larger block at the front was a corridor plan building with a central portion which would have contained the Master's quarters, committee rooms and clerk's office. The two wings of the front block contained male and female accommodation, probably with the aged at the front side and able-bodied or "dissolute" inmates at the rear. Children's quarters were usually placed at the far end of each wing. Perth main building from the north-west, 2001. Perth from the south-west, 2001. In the rear range of single-storey buildings were found various work and utility rooms including a bakehouse on the men's side and laundry on the female side. The 1901 map shows that a saw mill had been erected at the south of the site. After 1930, the poorhouse continued to provide social care accommodation under the name of the Bertha Home Poor Law Institution. By 1946, the establishment could accommodate 70 chronic sick, 56 certified mental cases, and 56 destitute paupers. 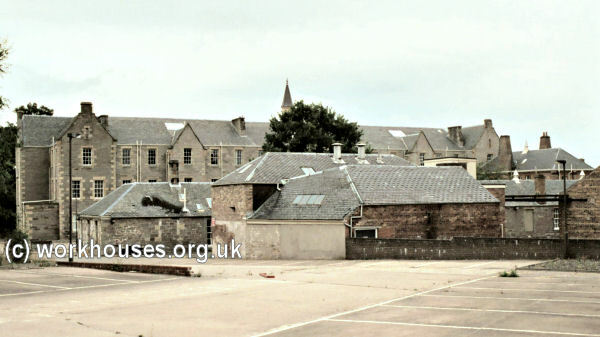 In later years, the buildings were used as offices by the local authority but were standing empty in 2001. It is understood that conversion to residential use is planned. Perth and Kinross Council Archive, AK Bell Library, 2-8 York Place, Perth PH2 8EP. Holdings include Poorhouse and residential home records (1859-1975).